Nearly every musician spends some time teaching. I didn’t come to teaching right away, but over the past 10-15 years I’ve built up some experience teaching different skills and ages. When I got to college, I was hired to take on a high school marching band percussion section. I discovered I really enjoyed it. I had a knack for making everyone in my group of misfits feel like part of the team – decidedly “uncool” as marching band was. My percussionists were already talented and picked up new techniques quickly. I did a lot of team-building exercises which helped them channel their musicality into playing well as a section. After that gig, I went to grad school and taught core music theory classes to college freshmen. I enjoyed that job even more, but it was a challenge. Music theory is a hard subject to love. Helping my students excel meant getting them excited about it anyway. Puzzles and jokes helped. So did analyzing pop music. Most musicians start out teaching private lessons. That wasn’t something that appealed to me initially, but I got there eventually. After I left grad school, I took a job in the corporate world, and volunteered a few hours a week with an organization called Seattle Music Partners. SMP is an after-school program that pairs volunteers with elementary- and middle-school kids who want to learn an instrument. I taught snare drum and bells to some sweet, smart kids. It wasn’t necessarily what they wanted to be doing right after a long day of school, but I figured out how motivated and confident they could feel by conquering their music one measure at a time. My successes as a teacher usually came from a focus on the “why” of playing music – the emotions and motivations behind it – as opposed to the “how”. Technique is something anyone can learn if they spend enough time on it. Lately, though, I’m thinking a lot about the “how”. I have a little baby at home now. (He’s the best.) I played some concerts when he was in utero, and I played for him a couple days a week when he was a newborn, but at eight months old, he’s starting to take an actual interest in imitating and learning how to make sounds. And so I find myself thinking more about how music is learned. I’ve read the studies linking music education to language development, and it’s a reason I’ve always championed music ed – especially through organizations like Seattle Music Partners, which reaches under-served kids – but I guess I never realized you can watch these connections happening in babies. My baby is starting to imitate the people around him, which will help him learn to talk. He watches my mouth when I’m talking to him, sometimes touching my chin and moving his own mouth to try and copy what I’m doing. Around the time he started doing that, I noticed a curious change during “music time” – when I bring out an instrument so I can play and sing to him, as usual, it calms him down – but now that effect only lasts a few seconds. He then starts screaming and crying. At first, I thought he was getting overstimulated, so I’d put the instrument away. But then I realized he wants to imitate what I’m doing by playing on the instrument. When I put it away, he would forget about it. I’ve started letting him (carefully!) touch the instruments I’m playing with. For example, I’ll hold a ukulele in front of him, show him how to pluck the strings, and watch as he imitates what I’m doing. We’ve had a lot of fun with drums. Hitting them is fun, of course, but I also showed him that he can make sounds on the drum head with his nails – and was surprised when he copied me each time, splaying his nails across the drum head to make noise. I signed us up for a music class which starts in a couple months. I’m looking forward to learning more about how to teach music to babies. Watching these initial discoveries has allowed me to think more about how we react to music education – and it’s fun, to boot. Last weekend’s weird Academy Awards ceremony has me thinking about La La Land – a nostalgia-filled musical homage to the city of Los Angeles and to Hollywood’s golden age. Central to the movie’s sentimental mood and theme of pursuing dreams is the ballad “Fools Who Dream”, which Mia (played by Emma Stone) sings for an acting audition in a pivotal scene. If the song sounds familiar, it’s because the exaltation of dreamers may have come via a shortcut (or, at least, a coincidence). Those first three notes are exactly the same. (But it’s important to note that these songs are in different keys. Because of that, these notes are contextualized differently.) There’s nothing particularly special about this sequence of notes on their own, but in the context of “Fools Who Dream”, I think they’re supposed to put us in a “Rainbow Connection” frame of mind. If you hum of the verse melody of “Rainbow Connection” over the chorus of “Fools Who Dream”, it works pretty well because the progressions are almost the same. Further, the rhythms are very similar (although the soloists flex it a little in both songs), and they’re both in triple meter (in simpler terms, you could waltz to them). Both songs have similar instrumentation. The upshot is that the composer, Justin Hurwitz, achieves that bittersweet nostalgia by invoking a song that is also bittersweet and nostalgic, and about which we may feel extra wistful because The Muppet Movie was awesome. As if that wasn’t enough, “Fools Who Dream” lyricists Benj Pasek and Justin Paul included lyrics which are thematically reminiscent of the ones Paul Williams and Kenneth Ascher wrote for “Rainbow Connection”. You may have noticed that connection already from my mash-up title. If you want to learn more about “Fools Who Dream”, check out composer Hrishikesh Hirway’s excellent podcast below for an interview with Hurwitz. (Interestingly, there’s no mention of “Rainbow Connection”, so it’s possible the similarities are a coincidence. I think it’s more likely they didn’t want to mention the inspiration they drew from a song written by the president of a performing rights organization.) Even if you’re not a huge fan of the movie or the song, there are some interesting tidbits – for instance, Emma Stone sang her solo while she acted that scene, and she had very few takes to get it right. That’s impressive. MIDiA has an interesting post this month on a topic that’s been on my mind: the price point of 9.99 (dollars, Euro, or pounds) for subscription music services. Streaming music is still on the rise, with 106.3 million subscribers in 2016 and a larger number expected in 2017 (thanks to factors like new services on the market, an expansion in the Chinese market, etc.). However, MIDiA expects this growth to slow down and reach a maturation phase by 2019. How did we get to the magic number of 9.99? Much of it has to do with record label agreements. Labels negotiate with music providers so they get a certain cut for each play of their artists’ music. Providers have to price their services high enough that they actually turn a profit. As it turns out, 9.99 is what a lot of subscribers are willing to pay. In order to prevent a stasis of subscriber numbers, I’m curious to see if subscription services are going to start playing around with different offers at different price points. Can a service charge more if they’re going to offer other perks, like early access to concert ticket sales? Can they offer niche subscriptions at a lower price point? (MIDiA mentions the Overflow, which is a Christian music service. I know there could also be a market for a classical music service with super clean metadata, but that market probably isn’t big enough to turn a profit.) Now that record labels are going full-bore with exclusives (see this great piece on The Ringer for an idea of my feelings re:exclusives), can streaming services offer an a la carte “exclusives only” option at, say, 2.99 a month so users can hear new music but stick to the 9.99 platform of their choice? No matter what, I think we’re going to see some interesting innovations in streaming music over the next couple of years. Spotify may not be making money yet, but the rise in streaming music subscribers has services feeling confident enough to take some risks. 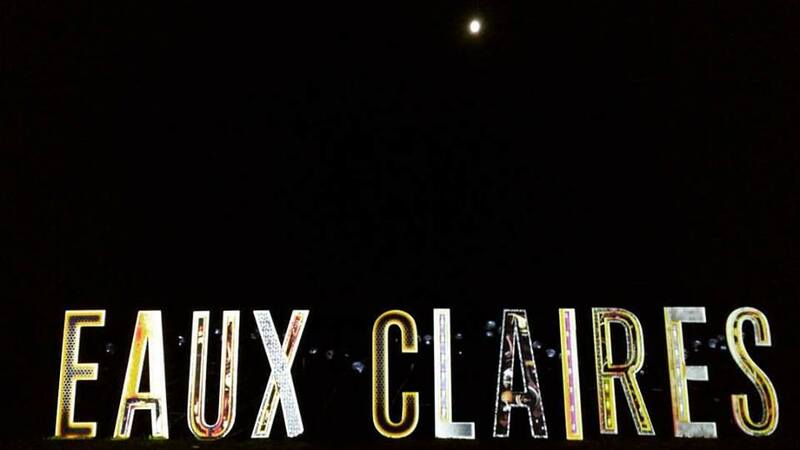 This is the same album Bon Iver premiered at the Eaux Claires festival back in August, and the full album was released today. I think Vernon made some brave choices on this record. Extended sax techniques on a pop record? Yes. The style is definitely is a departure from For Emma, but the songwriting and vocal stylings are similar. I’m glad he didn’t feel pressured to stick to one formula, and that he no longer has to start an entirely new project just to experiment with his sound. I also think that he tried too hard for an arena sing-along in “22 (Over S∞∞n)” and “00000 Million”. Somehow they’re a far cry from “Skinny Love” and “Holocene”. He would have done better by not pandering to his audience. Having said that, though, “22 (Over S∞∞n)” has gotten stuck in my head more than once. My favorite on the album is “666 ʇ”, where he and the band get everything right – the reverb-heavy guitar, light electronics, juicy bassline, buildup driven by the drums, etc. Overall, this one is growing on me, but I don’t think it will be my go-to listen. What I do love about this album is that it will likely have ripple effects of inspiration throughout the industry, in the same way that For Emma and “Woods” (off Blood Bank) led to some real shifts in the pop music world (amid the many second-rate copycats). 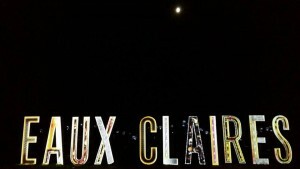 I never did get around to writing a review of last year’s inaugural Eaux Claires music and arts festival, located in my hometown area (Eau Claire, WI). It felt a little too personal to write about. It was a mixture of people I knew from school and famous acts making music together. I felt nostalgic and proud as I saw people travel from all over the world to an area that still feels like home. This year was not much different in that regard, though overall it felt a little more predictable, and therefore less magical to me. Nobody really expected Kanye to take the stage anymore, and I probably wasn’t the only local who’d given up hope of a Mount Vernon reunion. The rain that plagued us all day Friday, which only let up when Bon Iver took the stage, probably didn’t help our spirits. The lighting and art displays, however, were even more enchanting than last year. 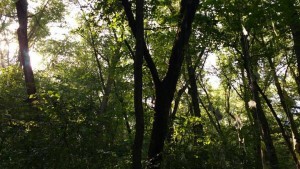 After sundown, the woods became awash again with color from powerful LED lighting. Winding paths encouraged discovery of art installations and a small hidden stage where my friend Sean led several performances (under the name S. Carey). 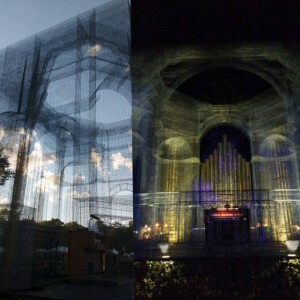 My favorite installation was an odd boxy creation sculpted from what appeared to be chicken wire. 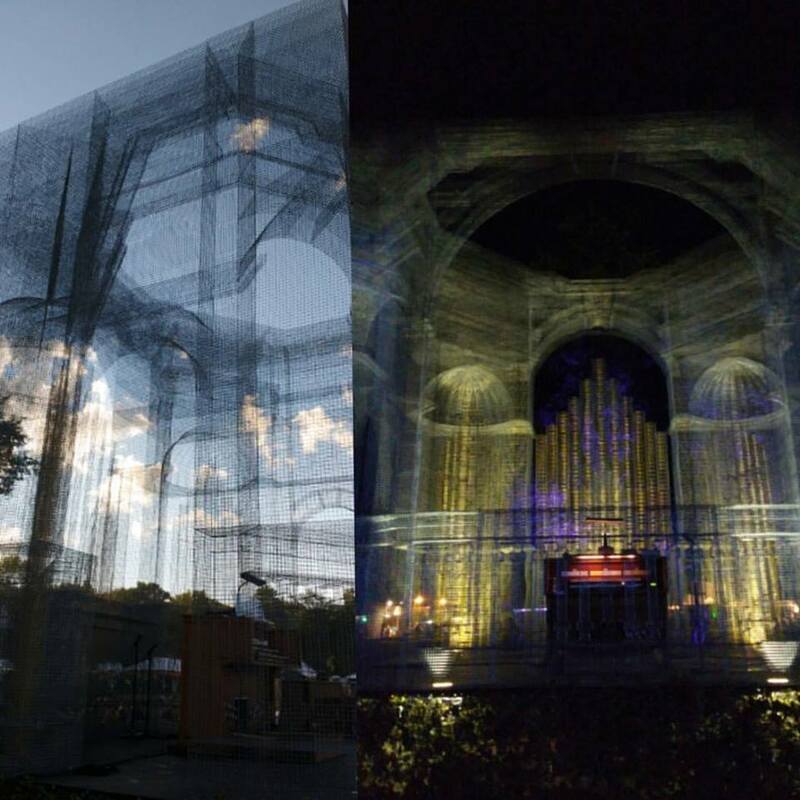 When the sun went down, its true form was revealed through a lighting trick: it was an illusion of a church organ. The keyboard part was real, and performers used it for interstitial music between headliner sets. While I would have loved more electronic, rap, and R&B artists, the music was the festival’s worthy focus. The musicians all seemed at ease despite the muggy/rainy weather. My favorite acts, in no particular order: Mavis Staples (who could have benefited from a later set with a loosened-up audience); Erykah Badu (who showed up late, teased “Didn’t Cha Know?” and “Window Seat” without actually performing them, left early, and still managed to show everyone how it’s done); So Percussion (because percussion); Vince Staples (the often beleaguered sound techs were at their best for him); Jenny Lewis (who mercifully stopped a song to have those sound techs fix her monitor levels, then filled her stage with women and sang about domestic abuse); my friends Phil Cook and S. Carey (who I can’t write about without bias, but trust me when I say they were great); Eighth Blackbird (who had a fantastic performance of Steve Reich’s Double Sextet featuring members of yMusic and So Percussion); and, of course, Bon Iver (who performed their upcoming album, 22, A Million, which will only get better with repeated listens). If you’re reading this, you probably have heard my company’s big news by now: we’ve been acquired by the performing rights organization SOCAN. I hadn’t written anything about it until now because I’ve been traveling and jet-lagged, but I’m very excited about this development. There’s a lot of talk in the industry about “transparency”, which I’ve written about before. SOCAN is working to make it easier for music content creators to track their payments, and the integration of our rich data into their business will get them there. As I’ve written before, we’re obsessive about data accuracy! The refrain we hear a lot is that of the “black box” in the music industry. I don’t favor that term because it hints at nefarious, sleight-of-hand activities. While that may have been present in the past – the mob was involved in the industry, after all – I don’t think that’s the case today. There are just a lot of parties involved in the release of a recording. Here is the quick explanation of music rights that friends sometimes ask me to give (after a couple of beers): When you listen to a song on a digital service, there are a lot of entities that are entitled to money. First, someone – or maybe a couple of someones – wrote the song, so they’re considered the songwriter. Their money is collected by a publishing company, which the songwriter may have established themselves, or maybe they asked an existing publisher to handle it for them. The songwriter is also represented by a performing rights organization (PRO), which is kind of like a songwriter’s union. (SOCAN is a PRO.) Next, you have a recording artist. This may be the same person as the songwriter, or it could be someone totally different. Maybe there’s a band, or studio musicians, so they all earned money on this play. In the traditional case, they have the backing of a record label, who signed a contract with them. This contract may have covered things like a cash advance to the recording artist so they could make a record. The label also handles things like touring, merchandise, and marketing for the artist. (They sometimes have a claim to some of that publishing income, but that’s a topic for a different day.) Maybe the label is a small one, so they rely on a distributor to get their music out into the world. These entities all have contracts to get paid for the services they provide. These agreements are made behind closed doors, so – for instance – while a recording artist may know the terms of their contract with a record label, they aren’t a party to the contract between their record label and a streaming music service. Some of this “black box”-ness is necessary, so it’s always going to be there. What we can – and should – fix, though, is the links between all the parties that should get paid through a play. There is currently no global rights database, so sometimes it’s not obvious who contributed to a recorded track. It’s the industry’s biggest problem, and it’s one we’re working to fix. I just re-read Stephen Witt’s How Music Got Free: The End of an Industry, the Turn of the Century, and the Patient Zero of Piracy for my company’s book club, and thought I’d share a playlist I made (Apple Music/Spotify). This list contains songs that were mentioned in the book, along with some singles from albums that were mentioned. The book was a fun read because the author is just a few years older than me, so his experience of early digital music was similar to my own (although I suspect he was a member of the music piracy leaking “Scene”, while I was not). It’s a cleverly crafted story that follows three separate threads through the ’90s and ’00s: the team who invented the mp3; Doug Morris, who has been an executive at all of the remaining majors; and Donald Glover, a blue-collar worker, who was the source of a staggering amount of leaked music. One of the most startling observations was that almost all of the music that was leaked during that period came from a very small, elite group. I thought of the peer-to-peer revolution as a crowd-sourced phenomenon, but that wasn’t true. The music that was leaked early was subject to circumstance, the availability of the CDs, and the cunning and whims of a few key people. As I’ve mentioned in another post, it boggles my mind that content is often restricted, making piracy relevant still. We had a spirited discussion about this during the book club meeting. We all agreed that if only the media we wanted was available and convenient, we’d be happy to pay for it. I think pirates will always exist – there are bragging rights involved, after all – but services and artists are not as helpless as they think. Taking content down from a streaming service ensures it will show up on The Pirate Bay. Digital distribution agreement terms might not always be ideal, but I think a collaborative approach will get us all further than restricting content. Our book club also talked a bit about the transition from music ownership to all-access streaming (which was not covered at length in the book, but here is a great article about that shift). When my generation was young, we bought CDs at $17 a pop. We’d have to really think about what we wanted to buy, because it could be a while before we’d saved up enough money for another. When I was in high school, our CD binders always rode shotgun. Suddenly, everything was available in mp3 form. It was important to amass the best collection of downloads in order to DJ college parties. Now, music is hosted elsewhere, and we don’t own any of it. But, of course, we never really did. We owned physical copies of intangible music. We never held the distribution rights. I find myself missing that Beats Music more than I’d expected. I liked the look and feel of it. Most everything I searched for was there (with the exception of streaming holdouts like The Beatles). I had a sentimental attachment to Beats after all the work I’d personally done for them. Because I relied so heavily on Beats Music, I find myself somewhat out of the loop when it comes to other services. As a way to find my new favorite, and educate myself about what’s out there, for the past few months I’ve been checking out other “on-demand” music services. Initial Impressions: Ugh. 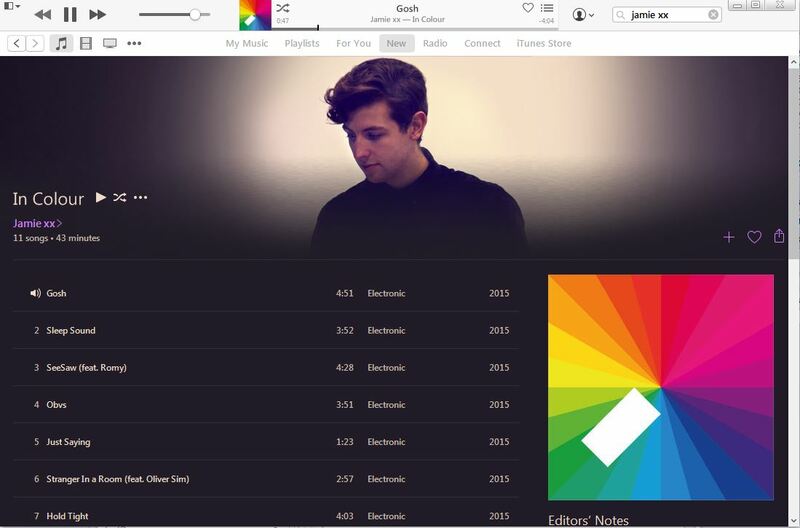 I don’t understand why I have to download iTunes. A streaming service should require an app download on a mobile device, but it shouldn’t require a desktop download. It’s an outdated approach, and a barrier to entry. Why should I have to download a desktop client in order to get quick access to on-demand music? From there, I found the Apple Music portion surprisingly difficult to find. It seems like an odd branding decision to keep iTunes and Apple Music somewhat separate, but one has to be accessed through the other. To find Apple Music, I had to click the “For You” tab on iTunes. 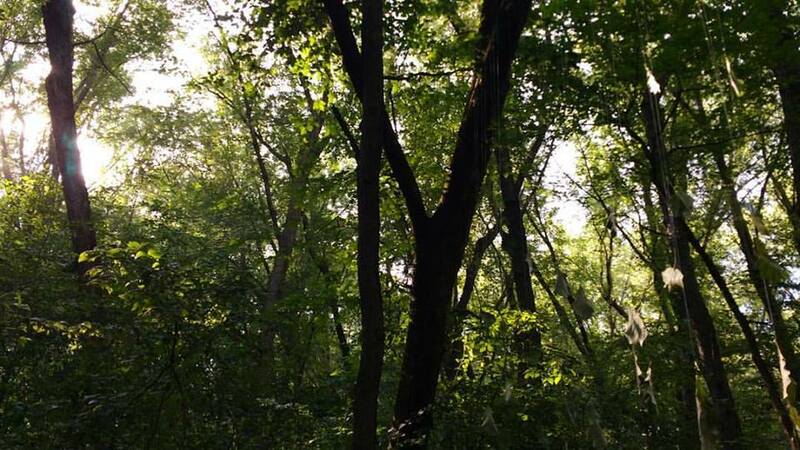 Beyond the initial hurdles, setup was relatively straightforward. Weirdly enough, it probably helps in my case that I haven’t been using a lot of Apple products lately. I have an old iPod, but I’ve never had an iPhone or iPad. My desktop computer doesn’t have a lot of music on it. Most of the issues I’ve heard about setting up a new Apple Music account have to do with the match feature, which didn’t apply to me. I wasn’t able to move my (small) music library from Beats to Apple, but that probably had more to do with me using a different last name and email address than anything else. Search function: One of the things I miss about Beats is that an artist’s page would list albums that were deemed “essentials”, as well as “latest releases”. I think Apple’s search results are a little jumbled, and their search might not be as powerful. For example, while searching for Anthony de Mare’s Liaisons — Re-imagining Sondheim From The Piano, I see the artist Anthony de Mare show up, but I don’t see the album, and I can’t seem to find it while clicking through Anthony de Mare’s page. What makes it weirder is that the album art has been selected for the artist’s art, so it’s probably intended to be available for streaming, but I can’t find it. Recommendations: Perhaps what interests me most about each service is their ability to recommend music to me. Apple has learned a little more about my tastes since I set it up, but it’s still a little off. My first recommendations were an intro to Spoon playlist (no) and an Alt-Country playlist (after I’d let them know I hate country). Radiohead, Kanye West, and Wilco are a little more attuned to my preferences, but that’s because I selected them from the bubbles when I signed up. Aesthetics: Apple is nothing if not sleek. The artist’s image is nicely integrated, and all the info I’d want at a glance is there. However, the UX isn’t perfect: I don’t love the way the search results look, especially since it seems to take a while to load. I’m also annoyed by the way the current song is displayed: it shows or scrolls across the top of the window, separated from all the other pertinent info, in a too-small font. Playlists: I think Apple brought a lot of the Beats playlists over with them, including the wide array of curators (Downbeat, Pitchfork, etc. ; they seem to have lost Naxos, whose witty playlists I miss). I like the “Intro” playlists, and there seems to be a fair amount of activity-based playlists. I spend more time listening to curated playlists than anything else, so the only improvement would be an even greater number of them, and I wish the playlists recommended to me were changed up on a more frequent basis. The other downside is the roundabout access to Playlists. I’m not sure whether this is the best way, but I’ve been accessing them via the “All Genres” pull-down menu on the “New” tab. Mobile app: I tend to do most of my listening via desktop, so while I’ve heard negative experiences of the Android app, I haven’t encountered many issues during my limited usage of it. However: it’s frustrating that there isn’t an Apple Music app for my Android tablet (running Marshmallow), but there is one for my phone (same OS). Maybe that’s Google’s fault, not Apple’s. The other main issue I have is that it doesn’t have Chromecast support, so I can’t cast it to my TV at home. When it comes to playing music at home, we usually opt for Spotify for that reason. 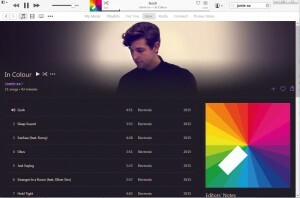 Summary: Apple’s vast music library and lovingly-curated playlists shine. The UX is decent, but reliance on iTunes is a deal-breaker for me. The lack of an Android tablet app and Chromecast make it even more of a chore to use. I’m looking forward to checking out other services, and will only return to Apple if I find other services’ playlists lacking. I made a playlist today for midwinter. It’s a good one for admiring the rain, drinking coffee, and thinking about crawling back into bed. Lady Gaga (and Nile Rodgers!) killed it in last night’s Grammys tribute to David Bowie. There were a couple of awkward transitions, but Gaga’s vocals on “Fame” made up for it.